Georgian House Guest AccommodationSituated on Bootham, close to city walls and city centre, a 2 minute walk to the Minster. No on site parking is available. Parking is available nearby for £8.00 from arrival until noon the next day, either in Bootham Row/Marygate. Please contact us directly for more information. Latest arrivals 10pm. Children welcome from any age. Georgian House sometimes limits bookings to 2 or more days. 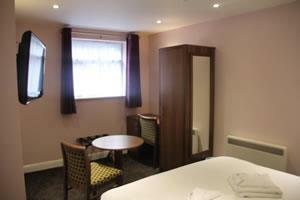 Small, but comfortable double en suite room located on the 2nd Floor, up a narrow and twisting staircase. Situated on Bootham, which is part of the A19 into York from the north. It is a 10 minute walk from York Station. Thank you for your feed back. In our program of continuing improvements, the front of the building was decorated and the windows were painted and dried shut, this has now been addressed.